Not always you want to solve things like WordPress provides and you seek for a different solution. Sometimes you don't need various applications of the backend to publish posts. A simple example would be a form, no matter where, where the contents of the form should automatically published on your WordPress blog. Alternatively, you could send it with a different status, and therefore only publish them if the admin approves it. For a good start, here is the function, which is pretty powerful and for all processes of the publication responsible. WordPress uses a whole series of constants and variables that may be useful. Even better if you know what is in there. 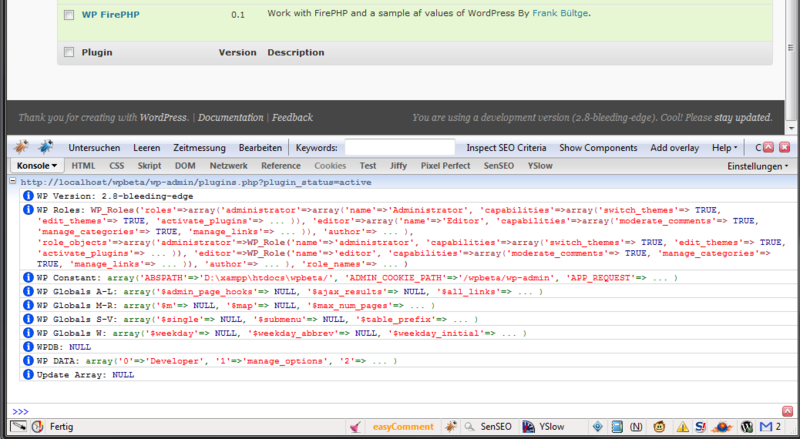 A clean output of the contents can be realized with the Firefox add-on FirePHP for Firebug. To symplify and accelerate my development, I always have a plugin activated, which outputs various contents, directly above FirePHP. Hence I created a small Plugin, which contains a whole series of constants and variables, which is based on the upcoming 2.8 version of WordPress. Because I think that this can be useful, here the download to the Plugin and the content, if someone has a solution and only needs the constants and variables. To work quickly and easily in WordPress with FirePHP, I recommend to use the Plugin. It requires no settings or something similar in the database, the code is exemplary, so that you can easily expand and areas can be commented out if some are not needed. We have a variety of content in it that are useful in WordPress, including the constants, global variables and PHP predefined variables. 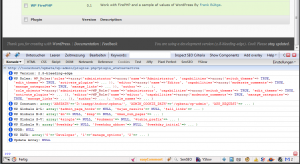 Download the Plugin in SVN of WordPress: WP FirePHP. The installation is as usual, put it in the Plugin folder and activate.